Nina Sayers (Natalie Portman) is a dancer in a metropolitan ballet company. After years of dedicated performances in supporting roles, she is finally given her shot when she is cast as the lead in a new production of Swan Lake. Her director (Vincent Cassel) believes that, whilst she can embody the virginal innocence of the White Swan, she lacks the pulsing sexuality to convincingly play the evil Black Swan. Nina becomes obsessed with her dual roles, and as she starts to believe that a younger, less skilled but more sensual dancer (Mila Kunis) is out to steal the part from her, she descends into a paranoiac frenzy. Much has been made of the striking similarities between Black Swan and Powell and Pressburger's The Red Shoes since both revolve around ballet dancers who, in taking on the lead roles in iconic works, find their lives eerily mimicking the story they are acting out. But just as relevant is their film Black Narcissus since, much like that film, Black Swan is driven by a dark undercurrent of reppressed sexuality that grows more pronounced as its lead character pursues perfection by trying to explore and understand her sexual desires. This fevered eroticism sets a frenzied emotional pitch that the film maintains throughout, largely thanks to a hypnotic central performance by Natalie Portman. As an actress who has herself struggled in the past to embody Black Swan-type roles, (for example, her role as a stripper in Mike Nichols' Closer has always rung acutely false to me) Portman exudes a darkness that I never suspected she was capable of, as well as a commitment to the role - she lost twenty pounds to convincingly play a dancer and continued work despite dislocating a ribe - that lends a disquieting authenticity to her performance. (It also plays into the idea that the film is, on one level, a metaphor for the way in which Hollywood chews up and callously discards actresses, an idea that the film does not broadcast but which it does not actively discourage.) She displays a surprising willingness to embrace the extremes of her character, and delivers a performance that is as bold as Darren Aronofsky's direction, which captures the speed and fluidity of ballet with the same unflinching gaze that it captures Nina's mad, wide-eyed stare. Aronofsky, whose small but varied body of work makes Black Swan both a surprising departure and a natural continuation, combines the skills he developed on his earlier films to make Black Swan an unlikely but distinctly ambitious culmination of his career to date. He displays the same level of detail in showing the mechanics of ballet, such as the different ways dancers prepare their shoes and the physical demands of performing, that he brought to The Wrestler. There are also, in the film's depiction of Nina's hallucinations, moments of magical realism that recall Ellen Burstyn's storyline in Requiem For A Dream. Most importantly, Black Swan shares a brave, foolhardy commitment to taking its bizarre concept and pushing it as far as possible with The Fountain, a similarly bold film that traversed the realms of space and time with the same lack of abandon with which Black Swan probes the psychic geography of its character. Yet for all these connections there is a quiet, rumbling menace to Black Swan that is wholly its own, one that builds to a crescendo of dread and horror in the film's lurid, bravura final third. It plays like a waking nightmare, a maelstrom of sight and sound that places us inside the slowly crumbling mind of Nina. Flashes of madness crop up early in the film, such as a moment when she walks down a darkened street only to see another version of herself walking in the opposite direction, and they manifest physically as a strange rash on her back. As the film progresses, and as Nina's obsession with perfecting her performance deepens, these flashes become bolder, longer and stranger. By the final act of the film, we are exposed to moments of almost transcendent insanity as Nina undergoes a literal transformation from awkward cygnet to beautiful, terrible swan. 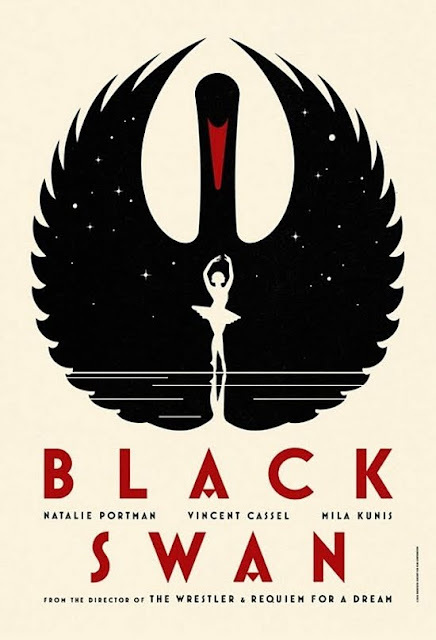 What's thrilling about Black Swan is not just that it is willing to fully explore the psyche of its main character, but that it maintains a wary ambivalence over whether Nina's pursuit of artistic perfection is inherently bad. Certainly, the toll that it takes on her both physically and mentally is terrible, yet the film also seems to suggest that the pursuit of true beauty is worth any price. It's a philosophy that could just as easily be applied to the film itself. Black Swan is a crazy, audacious and brilliant film that takes the audience on a journey into the creative process, with all its beauty and madness left in. The film is by turns sleazy, perverse and absurd, but always sublime. A magnificent, captivating and bewildering masterpiece.